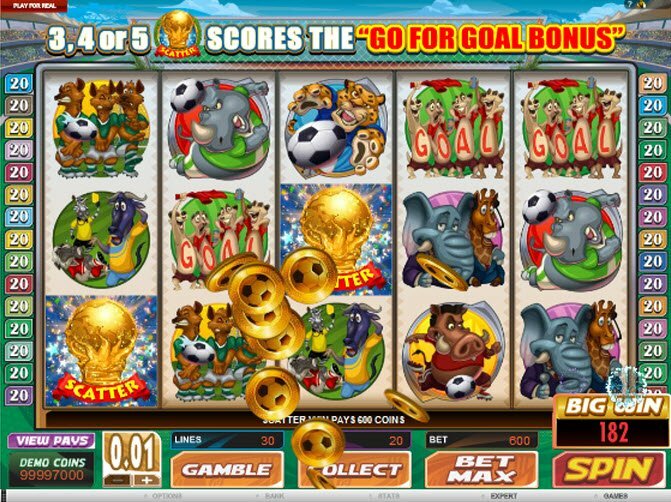 Celebrate your favorite sport just in the time for the World Cup with the Soccer Safari Slot Machine. This game comes packed with features that highlight this popular sport. 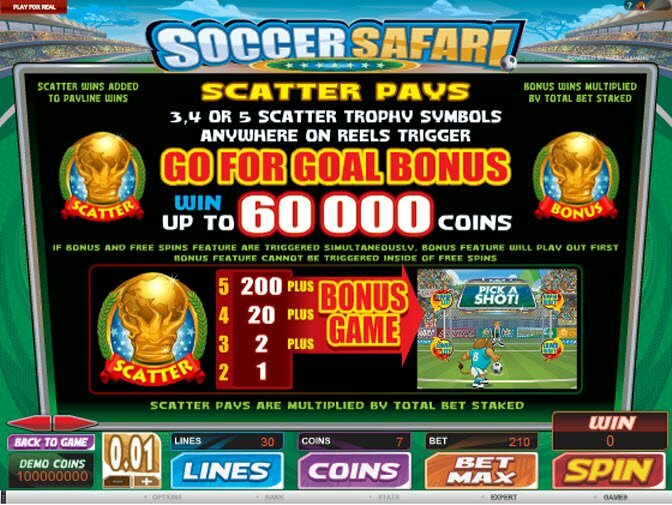 Scatter pays award up to 60,000 coins for lucky players that trigger the Soccer Safari jackpot. Expanding Wilds make it even more likely to win in this action packed game by Microgaming software. Welcome to the jungle! It’s the Soccer Safari slot machine. Soccer fans will get a kick out of the all the furry (and ferocious) African animals appearing on the reels playing soccer and cheering on the game. 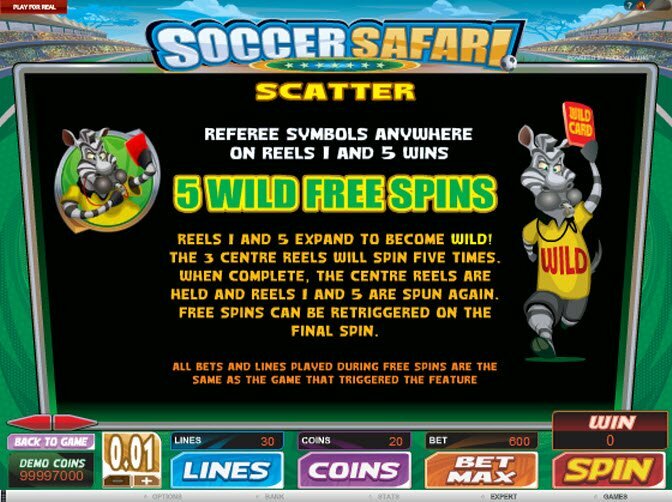 However, the rewarding bonus features and Soccer Safari jackpot prize make this game a “reel” winner! Powered by Microgaming, Soccer Safari slot software and graphics don’t stand out as the most innovative in the industry. However, the clever theme of animals playing soccer brings some charm and humor to the game. Don’t miss the warthog, rhino, cheetah, and lion chasing after soccer balls or meerkats and impalas cheering on the game. Meanwhile, the elephant and giraffe sit on the sidelines as the sports announcers while the clumsy hyenas avoid getting hit in the head with the ball. All in all, the cute theme and funny graphics make this a fun game, especially for those who love soccer and animals… or soccer animals? During the Soccer Safari bonus game, players pick a shot for a chance to win big payouts. This game gives a chance to win the massive Go for the Goal Bonus which awards up to 60,000! Take a deep breath because it may take a while to go over all the Soccer Safari bonus symbols. Of course, that’s a good thing! First of all, when the Zebra referee scatter appears anywhere on reels 1 and 5, they expand to make the entire reel wild. This gives even higher chances of landing on a winning combination. Meanwhile, the Soccer Pays logo serves as the game’s standard wild symbol, replacing all symbols except scatters. This symbol also rewards the largest payout. When 5 wilds appear, players receive 2,000 coins. The scatter pays symbol represents the ultimate prize. 3, 4, or 5 scatter trophy symbols trigger the bonus game. During the Soccer Safari bonus game, players pick a shot for a chance to win big payouts. This game gives a chance to win the massive Go for the Goal Bonus which awards up to 60,000!